6 pieces in one card. (This auction is for 10 cards = 60 batteries in total). Current Use Before Date Oct 2020 or later. (See size 312 and size 10 hearing aid batteries at this same great price, by scrolling to the bottom of this page and selecting your size and quantity requirements from our other listings there. 60 or 30 batteries listings available). SAVE UP TO 70% OR $9.11 PER CARD (TOTAL SAVING $91.10 PER 10 CARDS), AND PAY JUST $3.89 PER 6 PACK CARD. EQUIVALENT 6 PACKS OF THESE BATTERIES AT SOME STORES RETAIL FOR OVER $13.00 PER CARD. 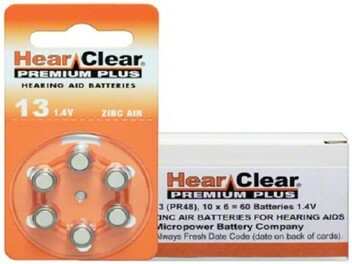 HEAR CLEAR BATTERIES feature a super long service life combined with a high drain output, our customers enjoy a hearing aid battery solution that will power the heaviest duty hearing aid device at two to ten times the longevity of any battery system. You can expect clearer tones with less distortion, constant voltage resulting in fewer volume adjustments, and fewer battery replacements. ALSO, SEE OUR OTHER LISTINGS FOR OTHER BATTERY QUANTITIES/SIZES/TYPES.